Here’s something I heard recently. “Men move toward whatever makes them feel competent.” As soon as I heard that I knew it was true. Every man I know migrates toward something that makes him feel powerful and in control. If it’s work, he puts in more hours, if it’s sports he’s constantly at the gym. I only bring this up because few men I know feel competent in intimate relationships, which might be one of the reasons they don’t sit around talking about how well they do or don’t get along with the people they love. That said, I don’t think men are as bad at intimacy as we might think. It’s just that we get pressured to go about relationships in ways that are traditionally more feminine, specifically we’re asked to talk about and share our feelings. We don’t really want to do that. Even writing this book is difficult for me, not because it’s a particularly hard book to write, but because I get tired of talking about my feelings all the time. Whenever it’s time to sit down and write, I get that same negative feeling in my stomach as I do when somebody wants to have a serious conversation about the soul. I can go there sometimes but it’s no place I want to live. The older I get, though, the less I feel bad about this. I realize there’s a risk in making generalizations about gender, because God knows every human being is unique but I think it’s safe to say most women connect with people in a different way than most men. I think men do intimacy differently and I think that’s okay. Before realizing [my wife] Betsy and I do intimacy differently I felt bad about the fact I didn’t always want to talk about things. Now I realize that’s not how I’m wired and I’m not supposed to be particularly good at it. That’s not to say I don’t sit and talk about my feelings, because I do and it’s important because that’s one of the ways Betsy connects. It’s just that I don’t kick myself around about it feeling slightly unnatural. I know I’m not alone in feeling awkward around the topic of intimacy. Most of the guys I know feel the same. 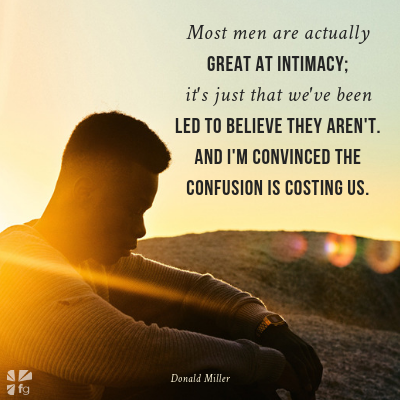 The problem is most men are actually great at intimacy; it’s just that we’ve been led to believe they aren’t. And I’m convinced the confusion is costing us. Years ago I worked on a government task force studying fatherhood and healthy families. As we met in DC, I learned one of the main causes of the breakdown of the American family was the Industrial Revolution. When men left their homes and farms to work on assembly lines, they disconnected their sense of worth from the well-being of their wives and children and began to associate it with efficiency and productivity in manufacturing. While the Industrial Revolution served the world in terrific ways, it was also a mild tragedy in our social evolution. Raising healthy children became a woman’s job. Food was no longer grown in the backyard, it was bought at a store with money earned from the necessary separation of the father. Within a few generations, then, intimacy in family relationships began to be monopolized by females. In my opinion, this has created a couple of generations of men who aren’t healthy. Desperate as we are to find and prove our worth, men can be tempted to view career as a path toward masculinity. Sadly, children can become a confusing hindrance in a man’s journey to find a sense of masculine power. Yet the men I know who’ve bought into this way of validating their masculine identity are often unhealthy. They come off as lonely and desperate. I can’t tell you how many men I know are, like I used to be, serial daters, moving from one woman to another, always three or four girls on the line, never giving a thought to choosing, committing, and wholly satisfying one of them for fear of taking their minds off their careers. But lately I’m seeing exceptions. Maybe it’s because my relationship with Betsy has caused me to notice them. But it’s true. There are good men in the world. Very good men. Excerpted with permission from Scary Close by Donald Miller, copyright Thomas Nelson. How does it make you feel when you hear “most men are actually great at intimacy”? Do you believe you’re great at relationships? Can you feel that pull from society toward other things…work or hobbies…instead of family and friends? We’d love to hear your thoughts in the comments.